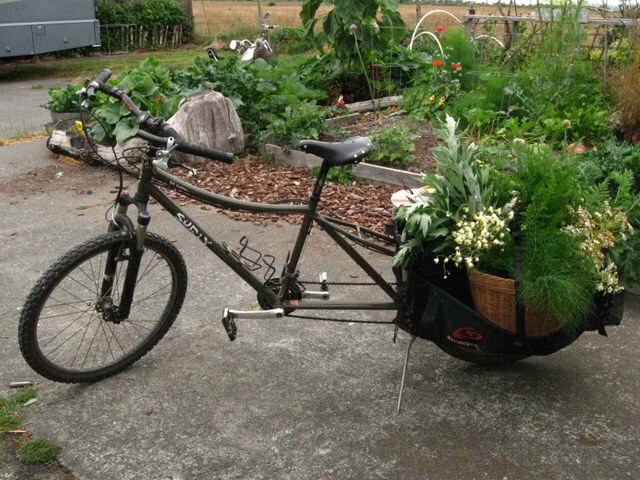 The produce-laden bicycle of local poet and organic produce exchange co-organizer Jacqueline Suskin, which normally carries her typewriter. 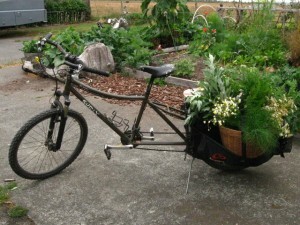 ARCATA – The Humboldt Permaculture Guild will host an host exchange of surplus produce from backyard gardens Sunday, Aug. 29 from 11 a.m. to 2 p.m. at 1158 Spear Ave. The exchange sponsored by the Humboldt Permaculture Guild with Democracy Unlimited was such a hit last year, organizers decided to try it again this year with much success. The second exchange has been organized in part by Peter Barker, Peter Oakland and local poet Jacqueline Suskin. Barker said local distribution is as important as local production of produce and food. “By growing food in space around where we live, we are able to directly connect with the land, and at the same time touch base with our neighbors to see what they are producing,” Barker said. Keeping close to the source of our food, Barker said, means food security on the short term, but even more important is community security. Local food, he said, minimizes pollution as well. “Local, small scale sustainable agriculture produces less waste and builds healthy soil for future generations,” he added. Community members are on an honor system, showing up with bushels of fresh produce from their own backyards. The first exchange took place a few weeks ago, and organizers say they hope to hold one each month. Farmers turn out as well, and Barker said Green Fire Farms donated a box of summer squash. Fun aside, the organizers see the exchange getting better and bigger each year. The next organic produce exchange will be held on Sunday, Aug. 29 from 11 a.m. to 2 p.m. at 1158 Spear Ave. Participants are asked to bring surplus from backyard gardens, fruit trees. Organizers ask that all food brought be pesticide free. This entry was posted on Thursday, August 26th, 2010 at 5:19 pm	and is filed under News, Community, Environment. You can follow any responses to this entry through the RSS 2.0 feed.